This super simple salad certainly does not lack in flavor. 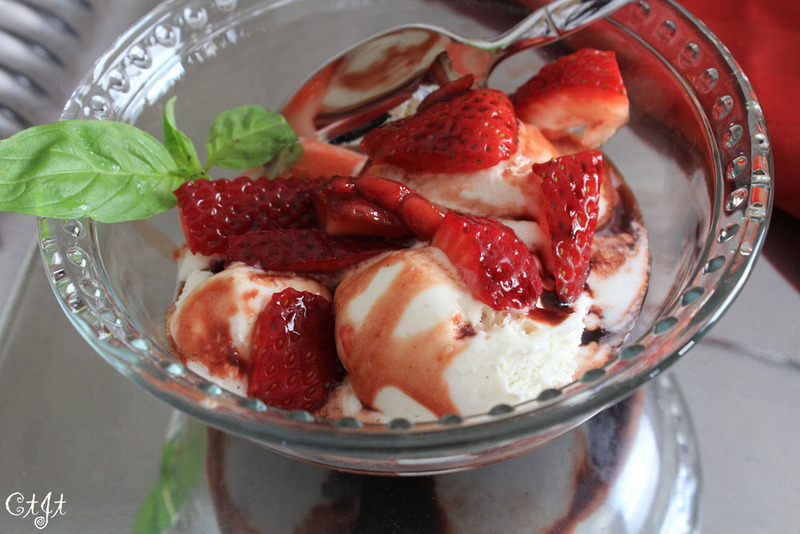 The tang from the strawberry balsamic pairs magically with the basil. Pair this salad with grilled chicken or fish for a nice summer dinner. Serves 2. 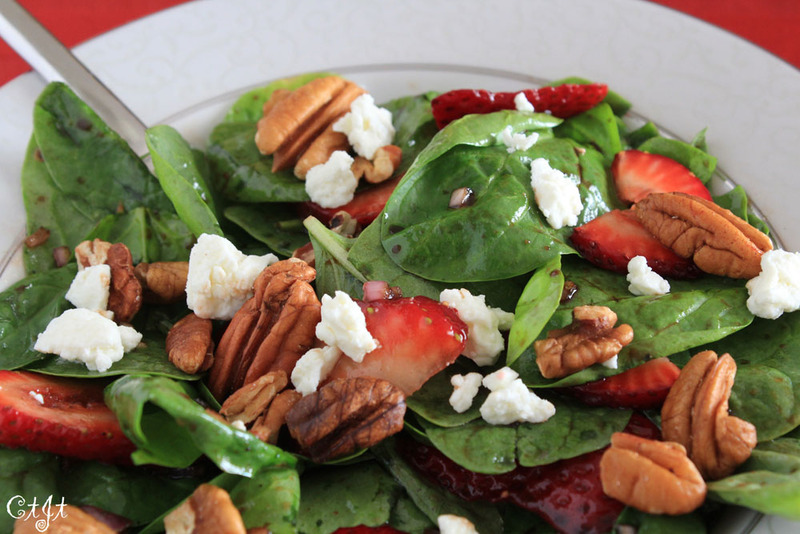 Directions: Toss the sliced strawberries with the spinach and basil in a large salad bowl. In a small bowl combine the shallot, balsamic and lemon juice. While whisking briskly, drizzle in the olive oil to emulsify the mixture. Season with salt and pepper, to taste. Toss the salad with about half the vinaigrette and top with the pecans and crumbled cheese, if using. Serve remaining vinaigrette on the side. Looking for a healthy alternative to traditional berry crisp? Try this one, adapted from Clean Eating magazine. It even uses coconut oil! Cleanup is a snap, too, because these are cooked in foil pouches – great for camping, don’t you think? Serves 4. Directions: Preheat grill to medium or preheat oven to 350F degrees. Cut 4 pieces of foil to about 12×14-inches each. Mist foil with cooking spray. To a small bowl add oats, coconut, almonds, 2 TBL brown sugar and cinnamon. Stir to combine. Drizzle in coconut oil and maple balsamic (or syrup) and mix until crumbly texture. Set aside. In a large bowl, combine strawberries, remaining 1 TBL brown sugar and lemon juice. Toss to combine. Divide strawberry mixture evenly into the center of the foil pieces and top each with oat mixture, dividing evenly. Bring short edges of foil together. Fold inward a few times along each long edge to seal all sides Place packets directly on grill or on a large, rimmed baking sheet in oven. Grill or bake for 15 minutes. Carefully open packets and place in bowls or and transfer contents to serving bowls. Enjoy! A good balsamic is already sweet due to the aging process, and our infused balsamics, such as the espresso, vanilla or strawberry balsamic, are the perfect combination of sweet & tangy. Serves 2. Directions: Put the berries and vinegar into a saucepan, over medium heat. Bring it to a slow simmer; let reduce for only about a minute. The balsamic will continue to reduce from residual heat, so don’t let it get too thick over direct heat. Scoop gelato into two bowls and evenly pour the reduction directly over the top of each serving. Garnish with a mint sprig and serve. Sigona’s strawberry jam, Sigona’s strawberry balsamic and sweet, red-ripe strawberries from Sigona’s local farmers in Morgan Hill…it’s a strawberry explosion! 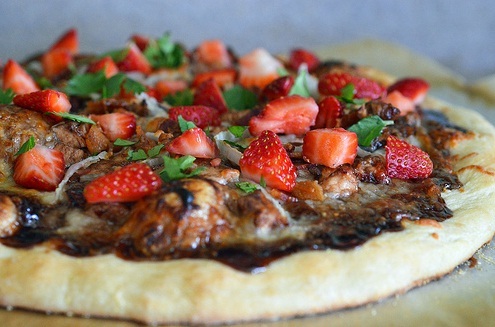 This sweet and savory pizza with a balsamic tang is perfect for your next book club or brunch! Recipe and pictures courtesy of Pennies on a Platter. Yield: 4 servings (Serving Size: 2 slices). Directions: Place the pizza stone in the lower middle of the oven and preheat to 500F or follow baking instructions on the dough package. Bring the balsamic to a boil in a small saucepan. Reduce the heat and simmer until reduced to half and mixture thickens, about 4 to 5 minutes. Stir in the strawberry preserves and chili sauce. Mix well; set aside to cool. In a small bowl, combine the chicken with 2 tablespoons of the balsamic-strawberry mixture and stir to coat all chicken. Spread the rest of the sauce over top of the pizza dough, leaving about a 1-inch border around the edge. Sprinkle 3/4 cup of cheese evenly over the sauce. Scatter the chicken, bacon and sweet onion over the cheese to distribute evenly. Sprinkle with remaining cheese. Transfer the pizza with the parchment paper onto the hot pizza stone (if using) and bake for 8 to 10 minutes (or follow dough package directions), or until the cheese is melted and the crust is golden. Remove from the oven and let cool slightly for 1 to 2 minutes. Top with the fresh strawberries and cilantro. Serve hot. Simply clean the strawberries and remove the stems. Put them in a blender with a little organic Agave nectar and blend just enough so as not to puree. I let this mixture set for about 5 minutes to meld all the juices and natural flavor of the berries. Pour the mix over pancakes and enjoy. So you have a half flat of strawberries…now what?